I’ll be honest with you, this game sort of crept up on me unawares a few days ago, when I was surfing the Wii Shop Channel looking for my next fix. The game had only just been released – on 19/06/09 – and to be honest I’d heard neither sight nor sound of it all the way through its development. It looked intriguing though, plus it had an odd name, so I took the plunge and parted with my cash. And boy, am I glad I did. But more about why that is later on. 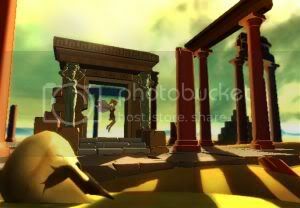 The game itself sees you taking on the role of Nyx, a female winged being, who is on a mission to find her lover Icarus. 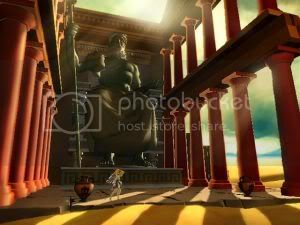 To do this she has to fly around what is now a ruined Greece – plagued by heat and perilous hot sand – solving puzzles and defeating enemies as she goes. You control Nyx by moving her left and right with the Nunchuk and using A to jump. Having wings however allows Nyx to jump more than once in mid air, and in fact a string of 6 jumps can be achieved – similar to multiple Kirby jumps in Super Smash Bros Brawl. Also holding down the Z button on the Nunchuk whilst Nyx is in the air will allow her to glide over a distance. Utilising this ability of jumps and gliding allows for plenty of accuracy in manoeuvring around the perilous environments ahead. But utilising simply this skill set throughout the games 12 levels would get very old very quickly. But luckily the gods – who are friends of Nyx – are on hand to help. God powers are controlled using the Wii Remote. You point the remote at the screen and a circular cross-hair appears. When you can use your god powers the cross-hair glows and you use the B button on the Wii Remote to use these powers. These powers include the ability to move rocks, control wind and also call on the lightning power of Zeus (tres cool). The way these God powers are given to you as you progress through the game gives the designers a clear model upon which to create a decent learning curve and difficulty as the game progresses, with each new skill not making the game easier, but actually the game presenting you with the harder challenges now that you have these new skills. And by the last level, you can really feel like the game is throwing everything at you. The game itself is essentially an old-school platformer, complete with flying and ground based enemies, the obligatory spikes, and the aforementioned deadly sand. The standard of the level design is very high, and there were a few times when I had a wry smile on my face acknowledging the design of some parts of it. But it’s not just the basic level design, but the way in which the levels ask you to use all of your skills and judgement to get past them that will really make you realise this is high-quality platforming. Essentially this is a proper Wii platformer – as the control scheme just wouldn’t be possible on other systems. You’ll find yourself having to point the Wiimote at the screen to use a God power, whilst you’re already flying in mid-air try to dodge an enemy and land on a tiny ledge. All these controls going on at once may seem complex, but I never found myself pressing the wrong button, as the game leans you into all the techniques very gradually so that you feel at home using them in awkward and challenging situations. There is also the option to have a second player control the Wiimote part (for the God powers) and the other player controls Nyx and her movement. The visuals of the game are competent enough, whilst mostly red, oranges and browns still give off a style and ambience that is fitting to the scene. There’s nothing ground breaking here, but they are certainly competent and fluid. The sounds and music within the game are very generic and serve a purpose. For example the game music gets a bit more frantic and drum-style beat gets added when you enter frantic or dangerous sections of the level, it all adds to the mood of the game, without every really blowing you away. The main gripe that most may have with this game is its length. With its 12 platforming levels, in my first play through the game took me just shy of 4 hours to complete. There is the added incentive to go back and collect all the hidden “relics” in the game – of which there are 20, I got about 10 on my first run through – but that’s about all there is for replayability. I can understand the frustrations of some for paying 1,000 points for a game that only lasts a few hours, but I can guarantee you that if you’re a fan of platform games its is a few hours of some top drawer entertainment. I’ve been knocking about the gaming world now for a fair few years, and even I was impressed with the standard of platforming available. So its short and sweet, that may or may not be a deal breaker for you, but all I know is I don’t regret spending my money and time on it one bit. So all in all a nice little surprise for me there and definitely not bad for only £7. Its not a perfect game, the intermittent mini-boss battles could have been a little more involved as could the final boss, and there are occasions where you think one level has played its particular card for a little too long before the end of the level is reached, but these are rare and incredibly minor flaws in a game that genuinely is a pleasure to play from start to finish.